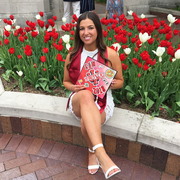 I recently just graduated from Indiana University. Growing up being the oldest of three I was always looking out for my younger brother and sister. I attended Syosset High School. I was a multi-sport athlete, playing volleyball, basketball, and lacrosse. As I attended Syosset High School I took on multiple babysitting jobs for family, friends and neighbors. I also was an assistant coach for the local PAL girls lacrosse team. I coached the 4th and 5th-grade team. Along with coaching I was soccer referee for the Syosset Soccer Leauge. I grew up going to Camp Wah-Nee then became a camp counselor for four years. I coached many tournament teams from the ages 8-16 while I spent my summers at Wah-Nee. I took on the assistant athletic director role which allowed me to get involved with other divisions other than mine. I started with girls going into 7th grade and was Read more with them for the next few summers. I still keep in contact with those girls and they are constantly asking me for advice and look to me as their role model. During my time at Indiana University, I participated in many philanthropic events. One event my sorority put on was a carnival for the local kids of Bloomington, Indiana. There I had little kids paint my face, throw water balloons at me and got to play one on one in basketball.